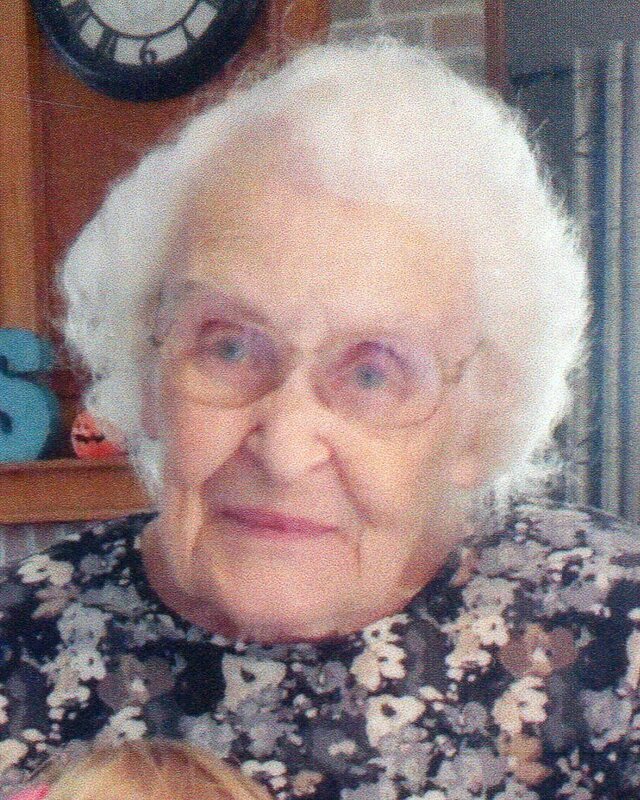 Virginia R. Corbin Axline 93 of Marion, died early Friday morning April 15, 2016 at Kindred Nursing and Rehab in Marion. She was born April 6, 1923 in Fort Madison, Iowa to the late John Lloyd and Irma A. (Young) Meredith. On August 9, 1943 she married Robert C. Corbin. He died October 25, 1984. She then married William A. Axline on June 22, 1995. He died March 21, 2015. She was also preceded in death by a brother, Donald L. Meredith; two step-children, Sharon Hyden and Sheila Schaffner. A graduate of Agosta High School, she attended Bowling Green State University. Virginia was a long-time and dedicated member of the New Bloomington United Methodist Church where she taught Sunday school for 12 years and was president of the United Methodist Women for several years. She worked for L & K Motels and Restaurants for 16 years in the payroll department. She had served as Clerk-Treasurer for the village of New Bloomington for 18 years and volunteered at Marion General Hospital for 20 years, beginning on March 16, 1995. She is survived by her children, Linda Sue (Fred) White, Harpster; Sandra Jean (Woodie) Jordan, New Bloomington; John M. (Lynn) Corbin, Marion; Robert “Tom” Corbin, Marion; step-children, Sue (Robert) Honse, Findlay; Richard (Cathy) Axline, Kenton; seven grandchildren, Cheryl (Jeffrey) Powell; Julie (Bryan) Dutton; Wesley (Amy) Gast; Nancy (John) Santagata; Brian (Emily) Corbin; Luke Corbin; Nick Corbin; seven great-grandchildren, Ava Tack; Dylan, Lauren and Kaitlyn Santagata; Raeley Gast; Bryan Dutton; Emily Dutton; several step-grandchildren and step-great-grandchildren. Funeral services will be Tuesday, April 19, 2016 at 11:00 AM at the Stofcheck-Ballinger Funeral Home, LaRue with Pastor Ben Schaeffer officiating. Burial will follow in the Agosta Cemetery. Friends may call on Monday from 4 to 7 PM at the funeral home in LaRue. Memorial gifts may be made to the New Bloomington United Methodist Church, 2540 Agosta Meeker Road North, New Bloomington, OH 43341 and Kindred at Home Hospice, 1199 Delaware Ave #102a, Marion, OH 43302. We are so very sorry for your loss. May the love of your friends and family wrap around you and help support you thru this tragic time. John, Lynn, Brian, Julie & family - so very sorry for your loss. Thoughts & prayers are with you. Prayers, and Peace be with you. So sorry to hear of your loss. You mom was a dear woman. Will miss her gentle smile at the family get togethers. May the good Lord be with you in your grief. My deepest sympathy to the family at your time of loss. Virginia changed my life by teaching me about the Bible when I attended the New Bloomington Methodist Church. She worked with me and my buddies. She did her best to lead us to Jesus. I am thankful for the foundation she laid for me to grow and understand God.